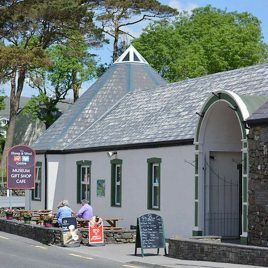 The Sheep and wool museum offers an insight into the importance of sheep and wool in Connemara’s past. Learn the history of sheep farming, local woollen industry and the process of how sheep’s fleece is made into cloth through technology, displays and demonstrations. Marvel as sheep’s wool is made into yarn at daily carding, spinning and weaving demonstrations, practiced on wheels and looms from the turn of the last century. Listen to interviews from those who remember the past. Enjoy quirky slide shows and allow children to discover what their role would have been in the 1900s through hands on experience. You can also meet a sheep and admire the art of hand shearing by a local farmer in July and August.